How to Perform an OPEX review on Oracle Support. In this difficult economic climate, we are all under pressure to reduce costs and support and maintenance renewals are often getting increasingly scrutinised. 1. Unaware of what we are paying for but assume that it is correct. 2. Do not understand Oracle licensing. 3. Do not have the time or resource to investigate. 4. Have been led to believe we can not cancel support. We will run through each of these reasons and provide some steps to help you move forward to understand whether an opportunity exists to reduce your annual support bill. 1. Unaware of what we are paying for but assume it is correct. • A history of buying piecemeal throughout the year(s) resulting in several renewal dates. • Departments purchasing outside of an agreed central contract in other local countries or through Oracle partners. • New contracts inherited via acquisition or merger. • Oracle’s own acquisitive strategy increasing the portfolio that you manage under their support remit. Even having a handle on your annual support bill does not mean it is correct. Is that legacy reporting system or old forms based application still being used from ten years ago? Have you moved to processor based licensing but still have an excess of Named User licenses? If you have had any business change (reduction in headcount, divestments, acquisitions, infrastructure refreshes etc) then you may be paying for support not being used. Conversely, you may have an IT landscape not aligned to the original licence metrics or volumes contracted for – so beware. We understand that it can be a moving target and it is the business Madora Consulting are experts in. Feel free to drop us a question via Twitter or you can email info@madora.co.uk or our contact form on our website. Madora Consulting are keen to assist. Most of us are carrying the role of 2-3 people and finding time to focus on an activity to assess your support may be a challenge. Why not let Madora Consulting take some of the strain? How about contacting us for a no obligation discussion to better understand the complexity of your situation. It may be that we give you a few pointers to enable you to be self-sufficient and on your way, we will be happy to help. If your situation is more complex then it may be worth investing in a 1-2 day support diagnosis workshop where we work with IT management and Procurement to get a view on the complexity of your organisation, spend history, architecture and Oracle portfolio. The outcome of this workshop is to ascertain at a high level whether we believe there is opportunity to reduce the support. The report will also advise on the potential effort required to follow through on a detailed Support Assessment and follow through with Oracle on the execution of any changes required. There are lots of mixed messages out there in the Oracle eco-system. 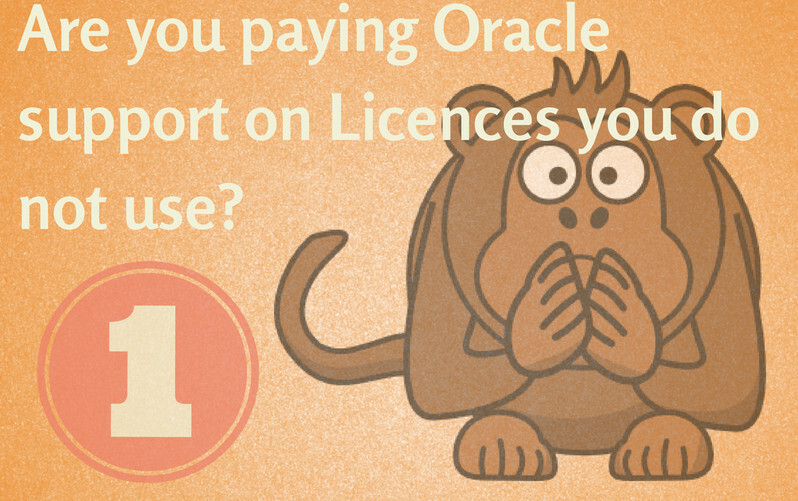 Oracle have also become more hard line on Support, insisting on the termination of licenses rather than shelving. Clearly, support revenue is the lifeblood of the Corporation, so they do their best to make it difficult to reduce revenue. The fact is that it is entirely feasible to reduce support revenue BUT there are a lot of what we call ‘Oracle Gotchas’. Just when you think you have a case to reduce support you get a swerve ball. Most of this is documented but involves some searching. The other thing to note, everything is negotiable, especially if you are spending on net new product. Again, we can guide you through this process and it is a process. Unfortunately, there is no simple linear checklist to work through here. So be prepared for 3 steps forward and 1 step back – a few times. Please contact us with any questions you may have on this topic. You can email us at info@madora.co.uk. We have looked at the four reasons we typically come across, as to why Oracle customers are not looking at reducing their support costs head on. Having addressed these issues, we will now look in more detail, at some of the steps you can take, to understand your support liability and assess the opportunity to reduce it. Let’s break this process into three steps. The first step is to understand how much you are spending across the business for all products. The next step is to assess whether these products are in use and/ or required going forward. The final step is working with Oracle to cancel support on products and to recalculate the support fee on contracts where a partial reduction in the product list is required. This post will cover the first step; understanding what support costs you are actually paying. If you are confident you have this information, you can then continue to step 2. Step 1; Understanding how much you are spending across your business for all products. What is required is a full list of the products that you are currently paying support on. There are a number of ways to get a view of your annual support revenue with a product breakdown and we have listed a few below. The first method requires working with your finance team to get an understanding of all support renewals that you have paid in the last 12 months and also get a view of what is coming up. Many transactions occur in November and May, being Oracle’s half year and year-end respectively, so pay special attention to these months. Depending on how large and complex an organisation you are, this could be relatively straight forward – or it could take a little time. Our advice is to give it a go as it is always interesting to get your own view and then compare it to what Oracle tell you. However, before you contact them, if your organisation is large, geographically diverse or has a complex legal structure, then, it is a good idea to produce a list of all your legal entities as Oracle will need this to produce a complete list of support renewals. The tools used by Oracle will do a fuzzy match on the company name to pull out all active support renewals by CSI (Customer Support Identifier). Not knowing your exact legal structure could result in missing out some entities. Include all your geographies, any legal names of acquired companies and any legal name changes in the last 3 years.If you do not have a contact in Premier Support then go via any current Sales Rep that you know and request a contact. They may need a nudge as the Sales Reps will generally see this task as a low priority or an opportunity to try and sell you something, so make sure they are aware this is just for awareness. Depending on the size of your organisation you may have a known dedicated Premier Support Rep in the field. This is usually the case if you are a Key Account, a Lead Account or Named Account. What determines this is usually the amount of annual support you pay Oracle. So you could be a small firm but with a large investment in Oracle technology and applications and hence still have a dedicated Premier Support Rep. Most other accounts are managed remotely via the Support Renewals team in Romania (if you are based in EMEA). One tip to get things moving is to request a consolidated support bill as you are considering paying all your renewals in one go. Perhaps you want to co-terminate all your contracts from a new stated date. Something we have seen a few times is negotiating a freeze on the annual support increments (typically 3%). Normally this is only achieved through a substantial licence purchase. In our experience this can be negotiated if you pay your 3 years support upfront. The last option is to contact UK COLS or LMS (Licence Management Services). COLS is the licence optimisation team that works as advisors to the Oracle sales team. They have a remit to advise on how to optimise licence estates. They also call upon the LMS team to verify licence positions usually as a result of requesting an Oracle Server Worksheet. A request to these teams will help understand your support renewals but you are potentially opening yourself up to increased licence scrutiny or a full review. Our advice is to focus on doing the internal support renewal review yourselves with some initial advice through Madora, then we may advise contacting Oracle Support. Until you have a handle on the annual support bill and what is deployed and in use, we would advise not contacting LMS or COLS. Let’s recap the overall process we are going for. The objective of the process is to understand what Oracle support is being paid and whether there is scope to reduce costs by dropping support. The first step is to understand how much you are spending across the business for all Oracle products. The next step is to assess whether these products are in use and/or required going forward. Now, today we focus on understanding whether any of the products we are paying support for are actually being used, if not, then to assess whether there is a case for dropping support. Ideally, we would like to do a full inventory assessment across the entire Oracle estate to understand the actual usage for every product in the organisation. Clearly a full assessment could be a lengthy exercise, albeit a valuable one. Therefore, our recommendation is to take an iterative approach with a rough first pass and then continue to refine if the initial results dictate the effort. Phase 1 – Go through each support line to ascertain whether these licenses are being used in current deployment. Usually but not always, customers buy software on an “as and when” basis. Unless you have purchased some sort of enterprise agreement, ULA or pool of funds, the line items on your spreadsheet when grouped by CSI (Customer Support Identifier) number will likely correspond to a group purchase of products at a given point in time that is related to projects or business systems which are underpinned by the technology. Hopefully there is still domain knowledge either within the business, procurement or IT as to what these licenses were purchased for. Working with your IT Operations team, walk through your support spreadsheet and sort by CSI number. This will show products purchased together on a given date. Ask the DBAs what servers these products are installed on and confirm with the business that these products are in use. It is possible that the hardware has changed or been updated since the licenses were purchased and this can materially affect the licence requirement. Do make sure you have enough licenses to cover the current infrastructure or note if you have an excess. Now if you find that the licenses are not being used or are surplus to requirements then don’t get too excited just yet as you need to be clear that these product licenses are not deployed elsewhere. In other words, although you believe the licenses purchased are not being used for the original project intended, has other product been deployed without your knowledge? It is not untypical for a customer to be over deployed on one hand and under deployed on another. For those licenses not in use, again tag and highlight the line items. Sum up all the potential product lines not required and make a decision on whether to proceed to the next phase. Whether it is worth proceeding will depend on just what percentage of the total support you are potentially reducing. Tens of thousands of pounds, or hundreds of thousands of pounds would make a big dent in the annual support fees. If the potential cost saving is big enough then further diligence is required in Phase 2. Phase 2 – A more detailed scan of inventory to check that products are not being used elsewhere. Again, in an ideal world a full inventory scan would be useful but for simplicity and speed an investigation into only the products that you believe are not being used is needed. The reason we do these imperfect passes is that we are trying to assess the magnitude of the opportunity or lack of it. Carrying out a full inventory review to find out that there is only a small opportunity for savings, may not be a good return of time and money. Instead, take an iterative approach to get a view on whether to proceed and get more detailed information on which to make a decision. For each server in your estate request the DBAs to run a script to identify if the products are installed and in use. We would highly recommend using an automated discovery tool to search your network across a range of IP address if your estate is large. If you cannot discover any more instances of the product then you are ready to start having a discussion with Oracle about reducing support fees. As you can see the process can be complex and arduous. Madora Consulting have been through this process many times and we can advise you at any point on the process. Why not get in touch for a friendly conversation to discuss whether we can help reduce your Support fees. Do you Need Help with an Oracle Review?